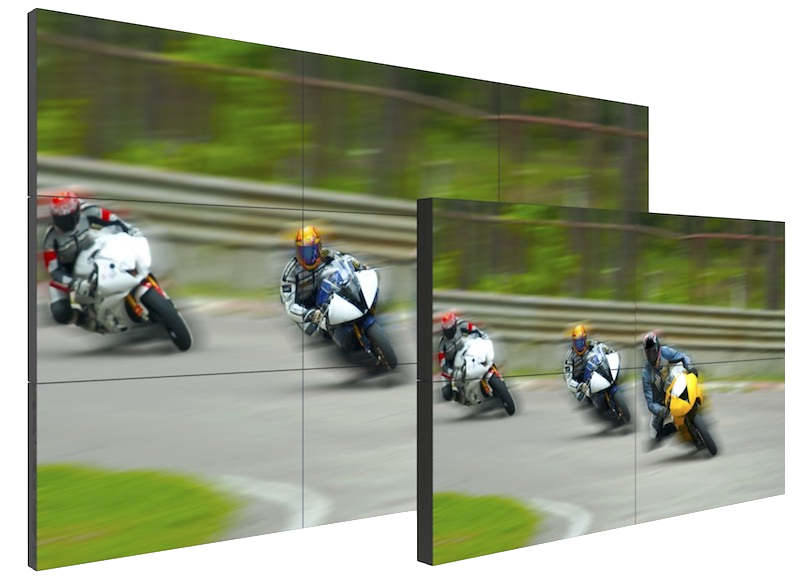 Volanti 55" video wall displays enable video walls of any size to best match the screen size or space available. Pre-configured: All displays are checked and calibrated to match before delivery to provide an optimized image across the video wall. 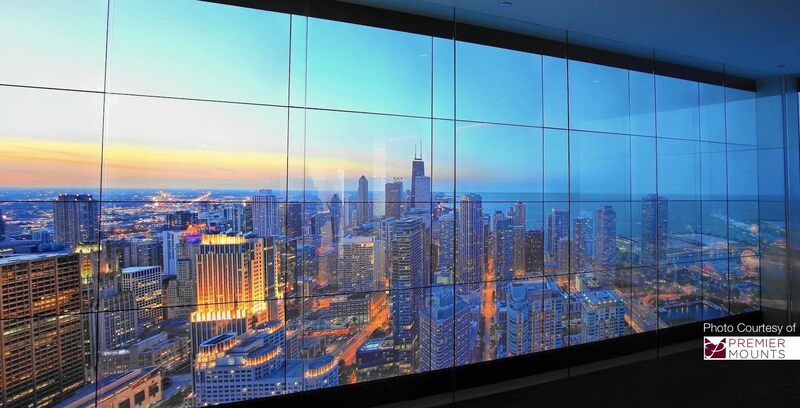 Cost saving: With our innovative connectivity and control you can input up to three 4K video feeds per display and show them full screen on each display or any image full screen across the video wall - all without the need for an expensive video wall controller. Our video wall displays have been setup, calibrated and labeled to make mounting, connecting and setup a very straightforward process. 55" diagonal: 47.8" x 27.0"
These high quality commercial video wall displays have extremely narrow bezels, just 0.9mm thick, they represent the latest available. 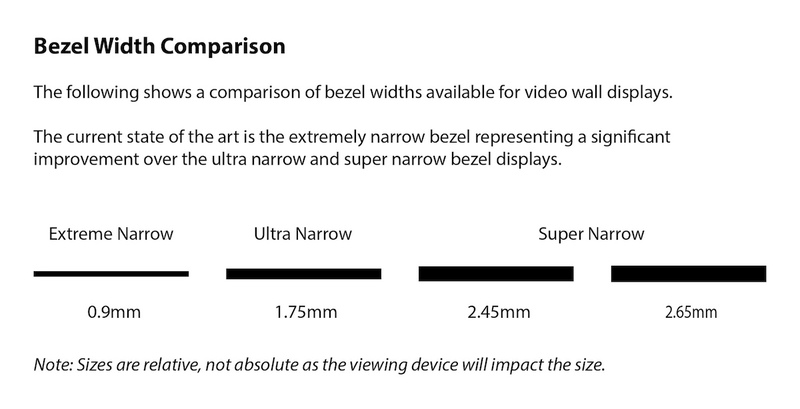 The following graphic is intended to show the relative size differences in size between our 0.9mm and other wider bezel video wall displays. Video wall displays, like computer monitors, digital signage displays and even consumer TV's use a measurement scale called 'Nits' or sometimes the equivalent "cd/m²" to measure their light output. Volanti video wall displays are 500nit compared to a normal TV of 350nit. 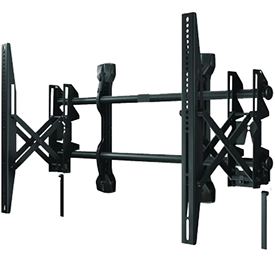 Mounting systems for video walls are readily available from manufacturers such as Chief, Crimson, Peerless and Premier. They enable wall mounting, on a straight or curved wall, as well as on moveable stands. 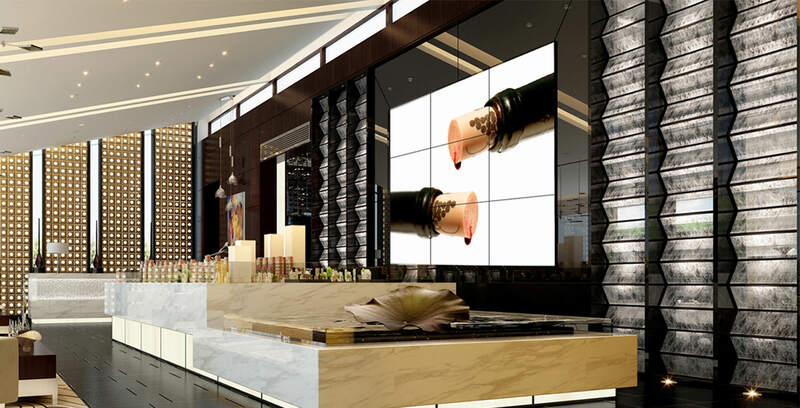 Volanti video walls are fully compatible with all major brands. Static and pop-out brackets available. Pop-out mounts allow easy access to any of the displays for maintenance. 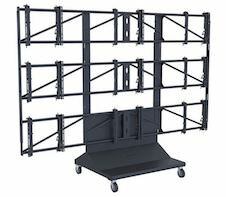 Moveable stands for video walls are ideal for events, maximizing usability. 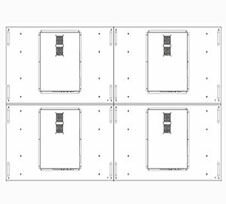 2x2, 2x3 and 3x3 are the most available sizes. A video by Premier Mounts showing an example 3x3 wall mounted video wall installation. 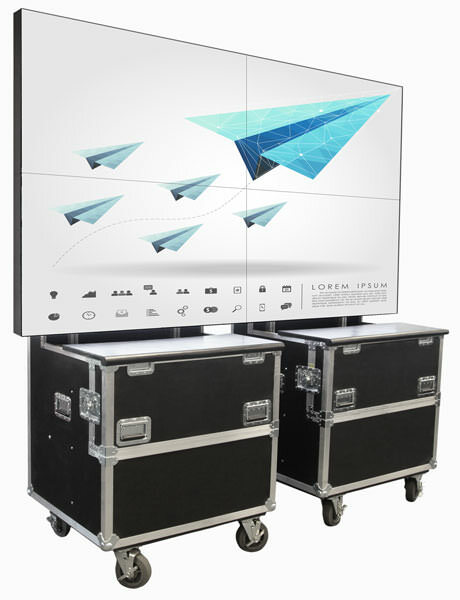 A complete mobile 2x2 video wall system built around two rugged transport cases that also form the stand. Fast & easy setup - click here for more information. file_download Video Wall Display: Extreme Narrow Bezel 55"
© 2017 Volanti Displays. All Rights Reserved.